Let’s start off with Final Fantasy XI, the first MMO Final Fantasy game. The music here somewhat reminds me of the compositions from Final Fantasy I & II games when they were remastered for the PS1. In a sense, some could see this as one of the last classic tunes of Final Fantasy before the time came to move on (and before Nobuo Uematsu would step down). Final Fantasy XI’s gone on for a decade now (the original releasing in Japan in 2002). So, what’s your preferred Job in Final Fantasy XI? While it might sound a bit sad, especially considering the crap the people of Colony 6 went through, Refugee Camp has a somewhat calming feel to it. All the people have now are what little belongings they have left and each other. They also have to to work with each other each and every day until either they can go back or move to a safer location. It’s a communal kind of theme, one of people working together. If you were chased out of your home, where on Bionis would you take refuge in? Final Fantasy X has garnered one hell of a polarizing fanbase in recent years. But no matter which side of the debate you’re on, many can that the music is still pretty damn awesome. Nobuo Uematsu would return to compose this Final Fantasy, the last one he would do fully. The music was to be more light-hearted than in previous Final Fantasy game (i.e. after 6), and in a sense return to that feel seen in entries like the first one, III, and V. Besaid Island would be the first town you’d encounter in Final Fantasy X, and would be the beginning of what to expect in game in terms of locations. Blue skies, lush greenery, rushing waterfalls, wildlife, and music to fit the mood. Say you live in Besaid Island and this song is playing. What kind of housework/errands are you doing while this song plays? Now here’s a song that’ll put you in the mood… to expose a corrupt government that is. All throughout the song the piano is out in front, laying out a consistent stream of notes for the melody. As it goes on, other instruments come in to aid the melody. The percussion falls in line with the multicultural-ness of the soundtrack to Beyond Good & Evil. Breaking away from describing the music, I remember getting this game used (I know…) for the PS2 the past Summer. It was a pretty lucky find in the local Game Champ considering how little it sold, which in turn affects how many are left in the wild. It’s one of those games many aren’t willing to part with. I can see why. It’s like a mix of Zelda, Metal Gear Solid, Pokemon Snap, Phoenix Wright, and Final Fantasy, all wrapped up in a gripping tale of government conspiracy and uprising. Remind me to finish up the game soon. I’m at the slaughterhouse and my colleague James says I’m past the halfway point now. So, what was the hardest animal to take a picture of? 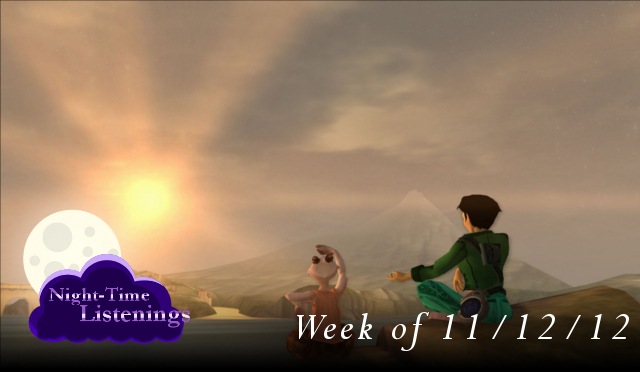 Let’s end this week with a trip to the lush lands of Chrono Cross. Hard to believe this game came out a little over a decade ago. While Chrono Cross’ got its fair share of derision from Chrono fans, it’s soundtrack at least is well regarded by many, and probably one of Mitsuda’s best soundtracks to date. Mitsuda made heavy use of acoustic guitars, flutes, and violins in this game, opting to make a more tropical and emotion-driven musical experience while leaving the more “epic” songs for when they’re truly needed. Arni Village Home World is a preview to the player of things to come in terms of music. The composition here drives home how much of a “home” this is to Serge. It might not seem like it at first, but once you go to Arni Village Another World, you really notice something is missing, and much of Arni feels different. So then, let’s have a little fun with the daily question here. Say that old man in the bar got caught by a wife of his ogling at that poster of Miki. What kind of excuse would you tell his wife to spare him the trouncing?